Vienna airport is Austria’s largest and most important airport. It is situated in Wien-Schwechat, approx. 18 kilometres away from the city centre and 4 kilometres away from the HEINHOTEL vienna airport. Handling approx. 17 million passengers a year, it is Austria’s largest and most important airport. It also plays an important role in Western and Eastern European air traffic. As such, it comes as no surprise that airport parking near Vienna is highly sought after. The City Airport Train (CAT) takes passengers non-stop from Vienna Airport to the city centre of Vienna (“Wien-Mitte”). The Vienna Airport Lines bus services take you from several places in Vienna (Schwedenplatz, Westbahnhof) directly or with a few stops to Vienna Airport and back. Transportation to Vienna airport is most affordable by urban railway. This train and the City Airport Train run in 30-minute intervals between Wolfsthal, Vienna Airport and Vienna city. Find the HEINHOTEL vienna airport at the stop Mannswörth just before the airport. If you are travelling by car, take the motorway A4 and then the motorway exit “Flughafen”, which will take you to the airport terminals. Want to travel and are looking for an affordable yet high-class hotel near Vienna Airport? The HEINHOTEL vienna airport is the right place for you. Located in close proximity to the airport, it provides the peace you’re looking for, with relaxation options in the Danube-Auen National Park and in-house sauna area. Reach both the airport and the city of Vienna in no time by taxi, train or car. 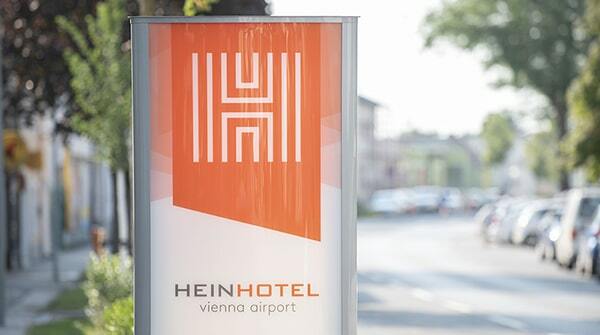 Book your personal room with airport parking near Vienna directly online or send a non-binding enquiry and look forward to a pleasant stay at the HEINHOTEL vienna airport.